Our objective is to find the velocity, acceleration, momentum, force, impulse, and work of a basketball during jump shots . To test for these dependent variables, we will use a high speed camera to track the basketball as well as the velocity generated by the shooter's legs and arm. The video taken will be a side shot of the shooter that way the angle of the shot can be determined as well as the distance of the shooter from the basket. After uploading the video to Tracker, we can easily calculate the position, velocity, and acceleration of the basketball. By using the mass of the basketball (623g), we can calculate the momentum, force, and impulse. Inspired by the YouTube of Kobe Bryant jumping an Aston Martin, our group decided to choose a basketball related topic finally choosing the physics of a jump shot. Building upon the knowledge of the concepts of velocity, acceleration, mass, force, momentum, impulse, work, and the conservation of energy we learned in class we were able to devise the plan of measuring those unknowns required to properly analyze the physics of a jump shot. The tools used to measure the variables were a laptop, lab pro, wii mote as an accelerometer, and a force plate, scale pole, and the high speed camera. The first unknown we chose, as well as found necessary to find was velocity. To do this we relied on the high speed video and tracker, with a known distance; from the scale pole and a known time we were able to then determine the velocity in the x, y, and xy coordinate planes. 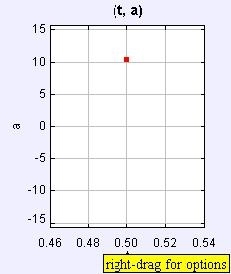 We found that in the x direction the ball traveled at a speed of 4.026 m/s and in the y 5.905 m/s. The high velocity in the y direction was due to being closer to the basket, which requires more force in an upward direction in order to get the proper arc. These velocities change relative to the distance between the shooter and the basket; if the shooter is close to the basket s/he needs a higher y velocity for the arc, as s/he moves further out the higher velocity for the x is required, this continues on until a certain point (depending on the strength of the shooter) where both the x and y will have to be nearly equal to balance the distance from the hoop and the arc required. From the tracker we were able to find the velocity in the xy coordinate planes which was 8.66m/s. This shows that the ball to hit a 10ft high target at 10ft required the ball to be propelled at a velocity of 19.3 miles per hour. The next variable we found necessary in order to determine the other required variable such as momentum, impulse force, and work was acceleration. We then went about finding the acceleration of the ball by using the tracker and the high speed once again. This gave us the acceleration of the x as 0m/s2, in the y as 10.353m/s2, and in the xy planes -10.353 m/s2. 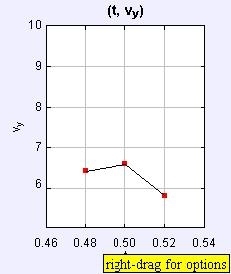 Based on residual memories of learning physics in 1st semester the acceleration of the ball in the x plane is 0.0m/s2 because, after the ball leaves the shooters hands the only force acting on it are gravity and air resistance; due to the latter’s negligibility and no other force pushing or pulling the ball to give it a positive or negative acceleration, the acceleration in they is0.0m/s2. In the y plane the acceleration was found to be -10.353m/s2. 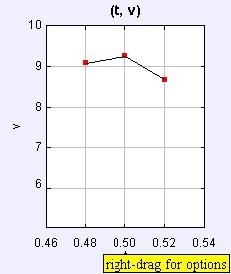 This is the velocity in the y plane because as the ball travels gravity, the only sufficient force acting on the ball, pulls down at a rate of 9.8m/s2 which is added to the decreasing arc of the ball of 2.53 m/s2, both of which have negative connotations due to their decreasing height. 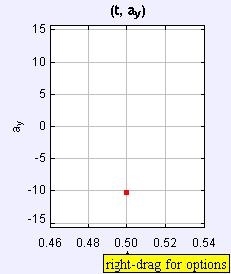 This 10.353 m/s2 is also the total acceleration in the xy plane due to having no x acceleration and the only acceleration was in the y direction this is then the xy acceleration as well. Along with the acceleration of the ball we used a wii mote as an accelerometer to find the acceleration of the shooter predominate arm. The data received from the wii mote, was in excess of 55 pages for 2 seconds of shooting, so as a condensed version one time will be used for each general motion, .as best as can be determined. As the shooter begins to propel the ball the x,y,and xy accelerations are respectively ,0.129630,0.000000,1.086207---m/s2; after the ball has left the shooters hand, which continues upwards, the accelerations are respectively ,0.037037,0.125000,1.034483--- m/s2; once the shooters arm stops, the accelerations are respectively, 0.000000,0.000000,0.000000---m/s2; as the arm returns, the accelerations are respectively ,-0.185185,-0.160714,-0.965517---m/s2; and as the shooter brings his arms back to rest the accelerations are respectively 0.018519,0.035714,1.000000---m/s2. These accelerations are all in relation to the movement of the arm, in this case up and forward are positive while backward and down are negative. Force: Force is defined as the push or pull that can cause an object with mass to change velocity. The equation of force is F=MA , or Force equals Mass x Acceleration. The mass of the ball, obviously staying constant, is 0.6236895 kg. The acceleration that was found in Steve doing a jump shot was -10.353 m/s2 in the y direction and 0 in the x direction. Therefore, using the force equation, the overall force of the ball is 6.457 Newtons. What this means is that about 6 and a half Newtons of force were acting on the ball was in the air. The reason why there was no force in the x direction is because the only factor affecting the ball is gravity which pushes the ball downwards and in no other direction. Therefore the overall force of the ball is the same as the y force acting on the ball. Impulse/Momentum: Momentum is defined as the measure of the motion of an object. The equation for momentum is mass x velocity. Impulse is defined as the change in momentum, or the force multiplied by the amount of time the object acts over. The general equation for impulse is the change in velocity x mass. 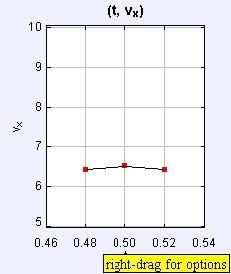 We found the momentum of the basketball by multiplying the mass (0.624) and the velocities (4.026 in the x, 5.905 in the y, and 8.662 overall) to get a momentum [in (kg)(m)/s] of 2.508 in the x, 2.679 in the y and 5.396 overall. The impulse which is the change in momentum over the time of the ball was found at .0997 in the x, -.255 in the y and -.998 overall. What this means is that the change in the momentum was a result of the change in force due to gravity. Because of the small amount of time that the shot was recorded, the number did not change very much. Work/conservation of energy: Work is defined as the amount of energy transferred by a force acting through a distance. The common equation for work is W=Fd, or Work equals force times distance. Based on the data we collected, the Work in the y direction is 3.668 N-m and overall is 5.595 N-m. What this means as that in order for the ball to be able to move, it required the 5.595 N-m of work to get from the point of starting to the point that it ended. The law of conservation of energy states that energy cannot be created or destroyed. The way that these two concepts relate is that the amount of work that was on the ball came from the work that Steve applied to the ball when he threw it. The limit of the work applied to the force can dictate how long the ball would be able to stay in the air. This is why it is extremely hard to be able to throw a ball even across a basketball court. With only the desire to find the simple physics variable we’ve learned in class along with a laptop, lab pro, wii mote as an accelerometer, and a force plate, scale pole, and the high speed camera, we were able to determine the raw physics necessary for the common athletic action of a jump shot. . Building upon the knowledge of the concepts of velocity, acceleration, mass, force, momentum, impulse, work, and the conservation of energy we learned in class we were able to devise the plan of measuring those unknowns required to properly analyze the physics of a jump shot. For clarifications of what we were thinking while researching the physics of a jump shot, see the parallel documentary video of the physics of a jump shot.